Joelle Skinner has shared a heartbreaking photo of what would have been her little girl's first day of school. To her shock and disbelief, doctors told her they couldn't find a heartbeat. 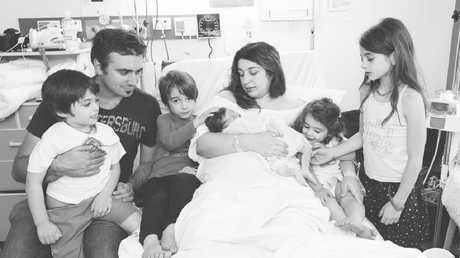 The grieving mother-of-six told news.com.au that she never expected anything to go wrong, that it was her healthiest pregnancy. "I just went into labour as normal at home but when I went to the hospital, they couldn't find a heartbeat and I had no idea anything was wrong. "It's still hard now to come to terms with it," Ms Skinner said. Mother Joelle Skinner shared this touching photo of her children, Isi, 13, Eden, 11, Jyrah 10, and Amali, 7 standing next to a hat — on what should have been the first day of school for her late daughter Zayli. 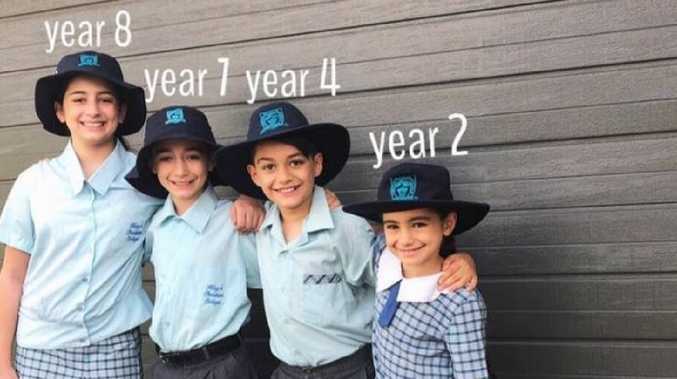 In honour of her late daughter, the Queensland mum took a poignant photograph on what should have been Zayli's first day of school. 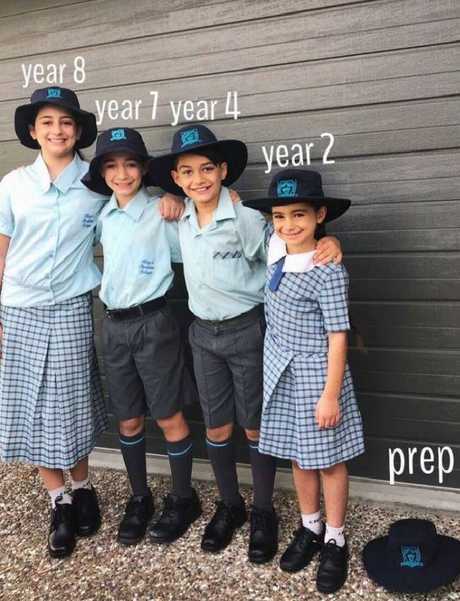 In the photo were her four other children Isi, 13, Eden, 11, Jyrah 10 and Amali, 7, all dressed up in uniform, standing next to a hat gently placed on the ground next to Amali - which is where Zayli would have been standing as a five-year-old Kindergarten student if she'd survived. 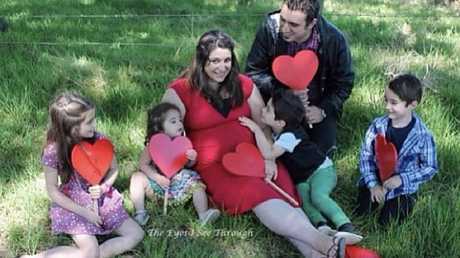 Baby Zayli died in the womb at 41 weeks in December 2013. "Then when I told them, they loved the idea. It was perfect, she is part of our life." "I was trying not to look at the other prep kids but it was really hard. When I got home I tried to keep my mind off it but I can't help but imagine her standing with the other kids." She while it is never easy, she has been able to find solace by sharing her words via her Facebook page Jedi Mum Tricks - a DIY page on making toys. 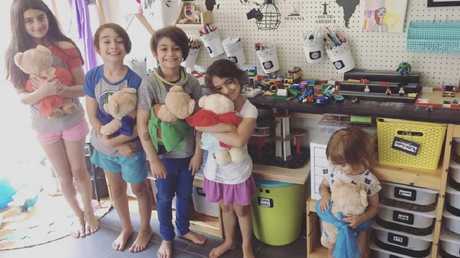 Ms Skinner’s children and her rainbow daughter posing for a picture — as they ‘unintentionally’ left a space for Zayli, ‘right where she would have stood’. 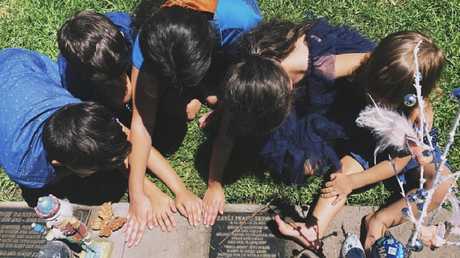 Last Christmas Day, the grieving family got together at the cemetery in honour of little Zayli. "I don't feel brave or anything, we were just doing what we can to keep her part of our life," Mrs Skinner told news.com.au. In December 2013, the mother was rushed to hospital where she was told her unborn baby daughter had suffered SIDS - a sudden infant death syndrome. Not a day goes by where the Skinners don't think about their daughter and sister. "It was like the ground was removed from beneath me and I began free falling, I still feel like I'm in free fall now. Nothing will ever be the same." Baby Zayli will forever live on in their hearts. "I just really hope her life was not in vein and she will have a legacy that will help other people and people who haven't gone through something like this to understand the pain. "To be able to talk about our kids and not have them forgotten." She said he's been told often that her posts have helped others process their own grief and give them permission to talk about it too. "I love my baby girl Zayli with all my heart and will speak of her whenever I get the chance." "My heart is with you Joelle," one mum wrote. Another said: "I know what you are feeling, it would have been our Xavier's first day at prep today." Joelle said it was healthy pregnancy there was no indication of anything being wrong.